While not the most unique promotional product out there, custom mouse pads are practical, budget-friendly and best of all, have eyes on them all day long. A nice mouse pad can add a pop of color to an otherwise boring desk. So add some fun to your office with our awesome custom mouse pads. 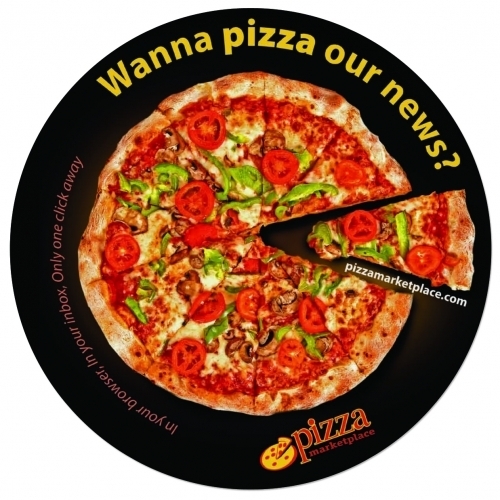 Not only can you customize them to include whatever image or text you’d like, but you can provide your staff with a much-needed accessory to make their everyday work lives easier and more comfortable. 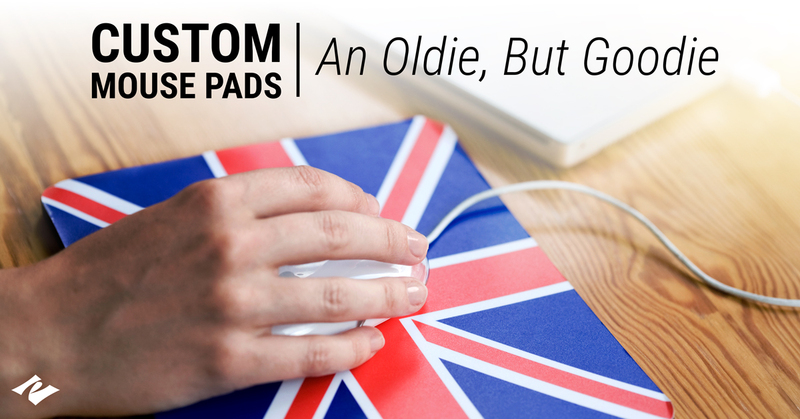 Mouse pads also make great giveaway items or promotional products to spread brand awareness. A mouse pad with your logo increases brand recognition since users will see your logo every time they use their computer, which, in an office environment, is daily. Make your custom mouse pads eye-catching and include your company logo before handing them out at trade shows, local events or even as a part of employee and client welcome packages. Why Use a Custom Mouse Pad? A mouse pad is much more important to your daily life than most people realize. If you complete the bulk of your work on a computer, you should pay careful attention to proper desk organization to avoid health issues like carpal tunnel. Repetitive actions, such as typing or scrolling with your mouse on a computer, can lead to carpal tunnel later in life. When you invest in a custom mouse pad with a good wrist rest, you can diminish some of these effects and avoid wrist pain. Order custom mouse pads to provide employees with a much-needed office accessory and personalize them to reflect your company. Select the colors associated with your business and your logo, or you can personalize the mouse pads with inspirational sayings to motivate your staff throughout the day. 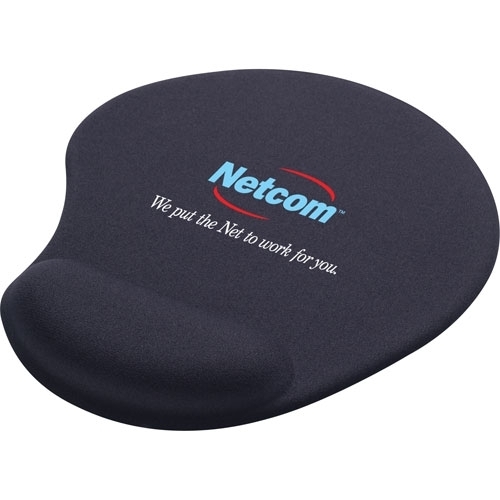 The round shape plus the full-color imprint makes this custom mouse pad help your brand stand out from the rest. The rubber base of the Origin’L Fabric 8” Round Mouse Pad ensures that this mouse pad won’t slide around a desk and the round shape provides plenty of room for original promotional designs and logos. With this one-of-a-kind mouse pad, you have an abundance of space to get creative with your design. With a standard design shape, the Memory Foam Mouse Mat® makes an impression with its extra comfortable memory foam wrist rest feature. Available in gray, black or blue, this custom mouse pad is both functional and attractive with plenty of space for a logo, image or other design. Best of all, the memory foam rest provides users with an enjoyable way to use their computer all day long. The custom Solid Jersey Gel Promotional Mouse Pad is available in three different colors—black, blue and red—and can be personalized further with the addition of your logo or other image. 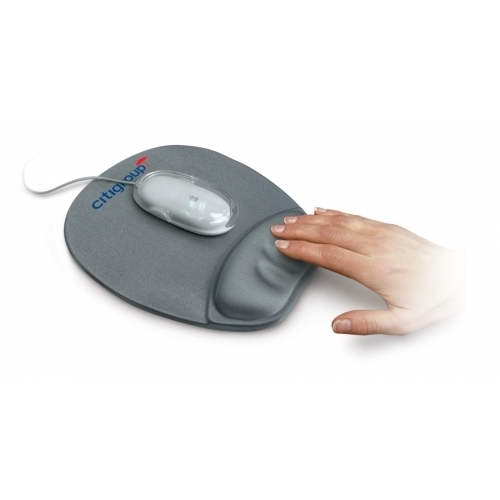 The comfortable gel pad provides great wrist support, making it easy and comfortable to browse with your computer mouse all day long. Plus, the sleek design makes it possible to carry the mouse pad with you if you need to bring your computer home with you after work. 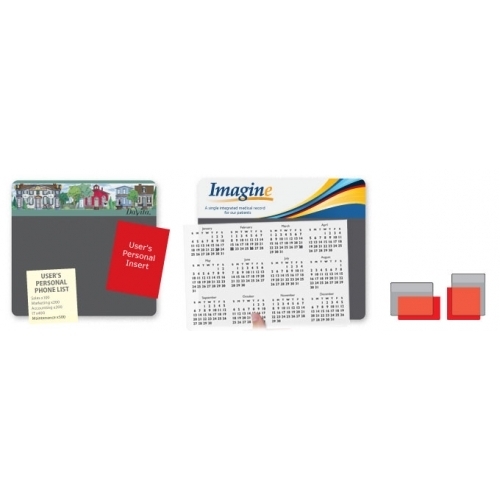 These Lift-top Mouse Pads are the perfect gift for the new year because they each feature a sturdy, plastic cover, which can easily protect helpful tools like a monthly or yearly calendar. You can also opt to keep to-do lists, memos or important notes underneath the durable covering as a visible reminder of important assignments or deadlines. 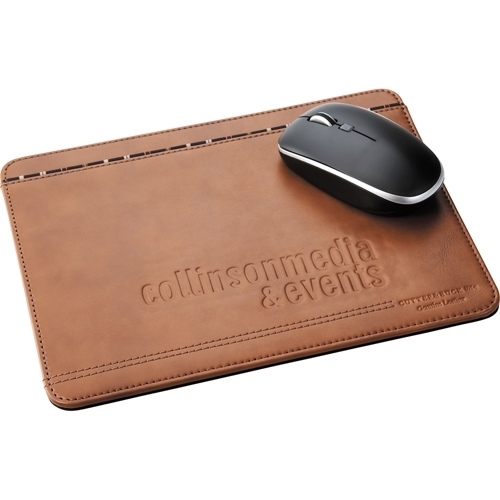 Manufactured by the upscale sports line Cutter & Buck, this custom mouse pad is made of genuine leather and is the perfect classy desk accessory. Designed to stick to any surface to prevent the pad from sliding around your desk, the Legacy Mouse Pad can be customized to feature a variety of images and lines of text. Because it’s created entirely from leather, the method of imprinting is a bit more intricate, so this process takes an extra few days to prepare. Most orders are produced within five business days. Make sure that all of your custom promotional products are of the highest quality by placing an order with Pinnacle Promotions. No matter what the occasion is, we have dozens of items available for personalization—everything from custom wine glasses to custom mouse pads. Bring these high-quality products along to trade show events or hand them out to employees to spread brand awareness and build customer loyalty. If you have any questions, you can reach our customization experts via the contact form or by phone at 800.351.4226.